Brian Kuhn, global co-leader for the IBM Watson legal practice, talks about why lawyers should be interested in cognitive computing (or augmented intelligence). Because they are unfamiliar with the technology, many lawyers are nervous about the growing popularity of artificial and augmented intelligence. However, others are welcoming the changes this technology will bring to the practice of law. 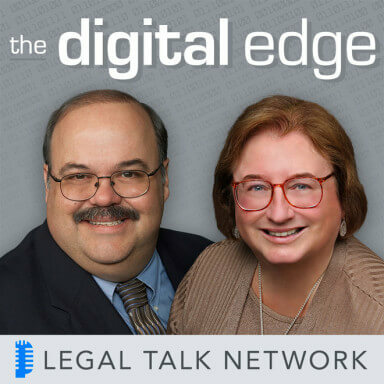 In this episode of The Digital Edge, hosts Sharon Nelson and Jim Calloway talk to Brian Kuhn, global co-leader for the IBM Watson legal practice, about why lawyers should be interested in cognitive computing (or augmented intelligence) and how legal professionals are currently using IBM Watson and other AI technologies. They also discuss blockchain and how it works together with AI. Brian Kuhn serves as the global co-leader for the IBM Watson legal practice driving global strategy and execution across clients, legal markets, and internal groups. Sharon D. Nelson: Welcome to the 117th edition of The Digital Edge: Lawyers and Technology. We are glad to have you with us. I am Sharon Nelson, President of Sensei Enterprises, an information technology, cybersecurity and digital forensics firm in Fairfax, Virginia. Jim Calloway: And I am Jim Calloway, Director of the Oklahoma Bar Association’s Management Assistance Program. Today our topic is the practical application of AI to the legal profession. Sharon D. Nelson: Before we get started, we would like to thank our sponsors. Thanks to our sponsor Clio. Clio’s cloud-based practice management software makes it easy to manage your law firm from intake to invoice. Try it for free at HYPERLINK “http://www.clio.com/”clio.com. We would like to thank Answer 1, a leading virtual receptionist and answering services provider for lawyers. You can find out more by giving them a call at 800-answer1 or online at HYPERLINK “http://www.answer1.com/”www.answer1.com. Jim Calloway: Thanks to Scorpion. Scorpion sets the standard for law firm online marketing with proven campaign strategies to get attorneys better cases from the Internet. Partner with Scorpion to get an award-winning website and ROI positive marketing programs today. Visit HYPERLINK “http://www.scorpionlegal.com/podcast”scorpionlegal.com/podcast. Thanks to ServeNow, a nationwide network of trusted prescreened process servers. Work with the most professional process servers who have experience with high volume serves, embrace technology and understand the litigation process. Visit HYPERLINK “http://www.Serve-Now.com” Serve-Now.com to learn more. We are very pleased to have as our guest Brian Kuhn, who is the Co-Founder and Co-Leader of Watson Legal. As an inventor and former practicing insurance attorney, Brian focuses on defining and building the Watson Legal business globally with an emphasis on business of law over practice of law use cases. In his role Brian is responsible for defining IBM’s overall strategic vision and go-to the market strategy for Watson Legal. Brian is a global thought leader on the intersection of artificial intelligence and the legal domain and speaks frequently at legal events in the United States, Europe and Asia. Thanks for joining us today Brian. Brian Kuhn: Thanks for having me Jim and Sharon. It’s a real pleasure to be with you here today. Sharon D. Nelson: Well, let’s start out Brian by asking you, what’s the difference between cognitive computing and artificial intelligence, because I note that IBM uses the term cognitive computing to describe Watson’s capabilities instead of using AI? Brian Kuhn: It’s a difference and not a distinction. So Watson relies on cognitive computing approach, as you correctly stated to AI, and our approach is very much one of augmented intelligence, and that’s what cognitive computing is considering, is augmented intelligence, empowering nontechnical end users like attorneys, like practicing attorneys, businesspeople with insights that amplify, that scale their expertise to ensure that they are more informed, not that they are replaced. And because we are very particular about that we say cognitive computing, cognitive computing dovetails with augmented intelligence. Most data, including almost all legal data, use what we call unstructured data. In other words, it’s narrative text, like a page in a novel or more appropriately a page in a legal professional journal or the contents, the substantive contents of a pleading. And human language, especially legalese, is full of ambiguity. We can express ourselves a hundred different ways, and we can say the same thing even more and we use sarcasm and tone that depends upon the context of the industry, the client, the interpersonal exchange that we are having at any given moment. And computers haven’t been able to touch this information, because they only understood us literally, but now they are capable of speaking legalese. So another thing that cognitive computing is capable of doing is understanding language in the context of the industry at issue. Jim Calloway: Brian, here’s a question I get asked frequently, why should the legal community care about cognitive computing or AI? Brian Kuhn: Really for three reasons. First, the world is producing data, meaningful data at an accelerating rate. Most of it is unstructured and human beings simply can’t read it, analyze it, and connect the dots, not anymore. Without AI we will be buried in data. And this is as true for the legal profession as it is for the medical profession for example. Second, with AI we can turn that buried in data scenario to our advantage, and perhaps even legitimately leverage it into the greatest professional advantage we have ever had, and I am talking about client service here. So for example, suppose you have represented Acme Corporation for 10 years. Acme hires you for a particular area of expertise. Well, what if you could use AI to read all of the work product you have created on Acme’s behalf as well as what opposing counsel has created, where relevant, and identify non-obvious connections that resulted in past success in the context of Acme’s needs. You could use that information to better serve Acme than you could achieve now, that any human being could achieve now in the hyper-context. And third, a third reason is that clients of law firms are investing in AI solutions to do a broad range of things, and the advantages that they provide are simply too great for these clients not to expect similar efficiencies from their legal service providers with the use of AI. Again, for example, if I am an insurance company and I invest in a tool that more accurately predicts claims fraud, well, technology like that will become table stakes. I am going to expect the same or similar efficiencies from the law firms that represent me. Sharon D. Nelson: Well, I know you are right about that because we are seeing that all the time. See if you can explain to me why Watson Legal focuses primarily on augmenting the business of law as opposed to the practice of law? Brian Kuhn: ROI, most cases take 18-24 months to settle a result at trial, that really means 18-24 months for an AI tool to demonstrate ROI in a practice of law scenario. Also accelerating the practice of law really doesn’t result in significant financial benefit for our clients, which is surprising, but this is what we have learned after conducting over 100 different use case identification workshops. Using AI on the other hand to help determine profitability, to repurpose prior work product in the context of the current scenario, to compete, to draft billing entries that are never rejected, these produce measurable benefits and also have a short time to value. Jim Calloway: How is Watson being used by legal entities today? Brian Kuhn: Most of our clients are corporate law departments and government agencies. Particularly the corporate law departments with large external counsel spend. We will pivot to serve law firms soon, but the most significant demand has come from the clients of law firms around reducing outside counsel spend and repurposing previous work product with AI in the context of the situation at hand. You will notice that that’s a common refrain and we will speak about it soon when we discuss the top ranked use cases that we are seeing globally that were a product of those 100 workshops we conducted. Jim Calloway: Okay, before we move on to our next segment, let’s take a quick commercial break. Sharon D. Nelson: Is your firm experiencing missed calls, empty voicemail boxes and potential clients you will never hear from again? Enter Answer 1 Virtual Receptionists. They are more than just an answering service. Answer 1 is available 24×7. They can even schedule appointments, respond to emails, integrate with Clio, and much more. Answer 1 helps make sure your clients have the experience they deserve. Give them a call at 1-800-answer1 or visit them at HYPERLINK “http://www.answer1.com/podcast”answer1.com/podcast for a special offer. Sharon D. Nelson: Welcome back to The Digital Edge on the Legal Talk Network. Today our subject is the practical application of AI to the legal profession. And our guest is Brian Kuhn, who is the Co-Founder and Co-Leader of Watson Legal. Brian, you have stated that you have developed a framework for evaluating and prioritizing uses for cognitive computing/AI in the legal domain. Can you summarize what that framework consists of? Brian Kuhn: Certainly. There are certainly good applications and bad applications as judged by business value and time to value. When we began Watson Legal, we met with and were fortunate to meet with all of the clients who said yes, we will agree to meet with you, and we heard them raise their hand and say, I want to do this with Watson, I want to do that with cognitive. But what we learned is that there are several metrics of success that we look at when evaluating the practical fit, the practical and ethical application of cognitive technology to the legal domain. On the one hand, historically when Watson Legal was a new business, we encountered scenarios where our clients brought us potential ideas and we were privileged to do business with them, we were privileged to speak with them so we said yes. But we learned from those experiences that there are patterns of interest that cluster into several broad categories. And we have conducted over 100 use case identification workshops in North America, Asia and Europe and we have asked our clients to bring ten ideas to each workshop. We will evaluate those ideas according to the metrics that I am about to share and we will end up with one prioritized use case. Well, we have taken those prioritized use cases back to the lab and we have ranked them globally, and that’s informed our go-to-market approach in terms of how we hope to serve the legal community. And so we begin by looking at whether or not a cognitive use case addresses that clearly recognized business opportunity goal or pain point. In other words, is it, hey, I want to do something with cognitive says the client, or is it an opportunity for us and the client to align such that we are not a hammer looking for a nail. And is it associated with augmenting busy or a high activity process, something that from a workflow perspective attorneys and legal professionals do a lot to confirm business value. And then does it have a cognitive element. In other words, does it involve doing something that people tend to do, such as reading, such as analyzing, such as training, or things to do with language? And does it utilize readily available high quality accessible content and the defined data repository of mostly narrative text, mostly unstructured data, not information in fields and databases, no SQL back-ends, but the substantive content of pleadings for example. So those are the first four elements that we look at and then from there we go a bit deeper and we look at four additional metrics. We look at the potential benefit of the use case to IBM’s client, is it high, medium, or low? It’s high if it provides a clear significant financial ROI. It’s medium if it provides a positive ROI, but is less quantifiable. And it’s low if the metrics are unclear with literally no clarity into potential ROI. So we look again at the benefit to our clients and then we look at the benefit to the end user, that might be our client and it might be the client of our client, a law firm’s client for example. Then we look at strategic alignment and this goes back to making sure that we are not a hammer looking for a nail, that we are not aligning with a client that wants to do something perhaps less than transformative that won’t really help them. So we try respectfully to guide them toward something that can has an enterprise-wide or practice area-wide effect on their business, a positive effect. And then finally, the fourth element is speed to implementation. In other words, some organizations have an appetite to do something transformative and that might take two years and there might be an implementation that consists of various stages, each delivering value, but it’s a long-term approach. Other organizations, they have an appetite for something small, something that provides a more immediate return on investment. And so understanding that allows us to better serve our clients. Sharon D. Nelson: That’s a long process, don’t you think, Jim? Jim Calloway: It really is. I was thinking I should have started taking notes when he went through that. Brian Kuhn: Well, but here’s the thing about that, it is a long process and so we are dealing not with a point solution. In the past products were sold in boxes. Everybody that downloaded a product, so to speak, got the same product. Here we are doing due diligence on the front end to make sure that there’s a fit, because we are taking something that’s 70% built and 30% customizable, and in return for that due diligence what our clients get is something that operates in the context of their needs, of their client’s needs, not in general. And so from that process we are able to bang the drum again for my context mantra and deliver value. Jim Calloway: Do you encounter reoccurring patterns of interest in certain use cases once you evaluate and prioritize use cases with clients, and if so, could you describe a couple of them? Brian Kuhn: Absolutely, I can think of two. So with corporate law departments the primary concern that they have shared with us, particularly in the financial services space, no one hires more external lawyers than financial services companies, banks and insurance companies, is outside counsel spend. These companies are spending 30-50% of their entire law department’s annual budget on outside counsel and are already using analytics to look at legal invoices. And so they are looking at structured information, UTBMS codes, timekeeper identity, how much time a timekeeper billed on a task. The lawyers, outside lawyers, they are incorrect in terms of their designation of UTBMS codes 30-40% of the time. We sold Outside Counsel Insights, which is a tool that I invented together with Shawnna Hoffman, my Co-Leader at Watson Legal, to an insurance client that had $1.3 billion per year external counsel spend and we showed them $392 million savings. They were already using structured data analytics; what we did, what Outside Counsel Insights does that’s different is that it reads like a person the narrative task descriptions contained within invoices and either designates the appropriate UTBMS code, or, I should say and/or provides a very granular high definition understanding of what an appropriate level of effort is for repeatable legal tasks and at an alignment and level with that. So the companies can move forth with evidence towards fixed fee billing strategies or can enlarge their fixed fee billing strategies. This is a tool that most large insurers in the United States are discussing with us right now. The second pattern is not unique to corporate GCs. The second pattern is the most dominant pattern across different types of legal entities and it really is cognitive knowledge management. We call it Early Case Insights, and I have hit upon it a bit already. The idea is can I mine my vast repository of historical work product that I as a law firm, as a practice area within a firm, or as a company that hires law firms and have used external counsel, can I repurpose this information in the context of my current needs. If I am a company this means perhaps I still need outside counsel, but in whole or in part I can repurpose work that I have bought and paid for and not have to repeat it and reduce the number of links from the chain in terms of needing outside counsel. If I am a law firm I can delight my client, because this is in the context again of their needs, what I have done for them. Perhaps I can even charge my client slightly more money in return for a more consistent, timely legal result and something that takes their unique needs and our relationship over time with that client into account. In other words, this is about operationalizing what law firms and legal entities do well, democratizing it throughout the legal organization and producing a profound level of consistency in delivering client service. Sharon D. Nelson: Interesting. Well, I certainly see some risk at least in applying cognitive computing/AI to the legal domain. I am curious to know whether you see any risk. Brian Kuhn: I do and that might sound provocative coming from someone for whom this is a great passion, however I do. The greatest risk I would respectfully submit is if the legal community; academics, practitioners, technologists, if the legal community doesn’t come together soon to think about a framework for the practical and ethical application of AI to the legal space, defined framework, a Sedona Conference analogue, if you will, the legal community needs to inform and own the narrative about how AI technology should and should not be used. And without the formal structure we are just reacting, and I say this respectfully, but definitively. There’s been a lot written about law firms in particular adopting technology at a slower pace perhaps than businesses and other industries, but in general, it hasn’t been an existential issue. Over the next several years deep technological prowess will absolutely be an existential issue for law firms, and so if I may at MIT, on October 30th and 31st of this year, in collaboration with a number of businesses, IBM is going to put forth a proposed framework that a legal community can change or alter, and then, as it sees fit, but put forth the proposed framework for the ethical and practical application of AI and blockchain technologies to the legal space. Sharon D. Nelson: Well, that certainly sounds like a good idea, and as you know, I wanted very much to be at that conference in 20:39, but I hope it goes well for you. I worry about things like human bias getting into the AI cognitive computing as it relates to say assessing the risk of someone committing another crime or trying to determine sentences for people, do things like that trouble you too? Brian Kuhn: They do. I was at a conference in Zurich, an International Bar Association conference in Zurich and a question was asked about judges training cognitive tools, not just IBM’s tools but cognitive tools, would those tools not inherit the biases of the judges? The answer is, potentially they would, but that might be a good type, because rather than moving forward with tools that inherit the biases of people we might use these tools as mirrors to show us our own biases, and then we can react accordingly, react differently. Perhaps that’s a way that they can be used in that context, access to justice is another. Cognitive tools are trained, they are not programmed, they reason like the people who trained them. Imagine lawyers using pro bono hours, donating pro bono hours to train cognitive tools in, for example, domestic violence law in a given state to help the dismally high number of litigants who have to defend themselves per se. We are doing a miserable job right now when it comes to access to justice as a country. I think that as a developed nation we’re second or last — or last in terms of access to justice of people with limited means. I don’t know if we can solve that problem with warm human bodies, I don’t know if we can scale. But technology, while no panacea, technology can certainly help going forward, and this is a quite positive implication of Artificial Intelligence in the legal space. Sharon D. Nelson: You’re more optimistic than I am, but I do love an optimist. Jim Calloway: Well, I think if somebody who’s been working more on access to justice issues, there is certainly a huge need there that it is in question whether we have enough warm bodies with JD’s to meet the need. Before we move on to our next segment, let’s take a quick commercial break. Sharon D. Nelson: Welcome back to The Digital Edge on the Legal Talk Network. Today our subject is the Practical Application of AI to the Legal Profession, and our guest is Brian Kuhn, who is the Co-Founder and Co-Leader of Watson Legal. So, what is your prediction, Brian? What will the application of cognitive computing/AI look like within the legal profession, and say, five years from now? Brian Kuhn: It will look quite different than it does today. We’re used to looking at AI from solution standpoint. In other words, most of us imagine using software tools similar to the ones that we currently have with the difference being that those tools also incorporate AI. I think that this approach is temporary, a bridge to something else, because the real power of AI is its ability to combine data from different domains of knowledge and generate net new insights. This is incredibly radical. Think about material science, Teflon and graphene. Most of those materials would have been discovered — have been discovered by accident, but if a cognitive tool had access to open source data, about these materials, research papers and so forth, people would be able to deal with no human being can do, no matter how smart, no matter how intelligent you or I are, we can only be truly brilliant, if we’re lucky, in one area. A machine can be meaningfully brilliant in many areas and can see non-obvious connections. I am really talking about creativity. To my material science example if most materials were discovered by accident and if the smart machine had access to information about metals and fluid viscosity, et cetera, et cetera, it would be able to read more in less time than a human being or even a team of human beings ever could to produce net new insights. I think that’s what we have to look forward to in the law, that’s what we have to look forward to in medicine, the cardiologists right now sees you as a heart, not as a whole person, but of course you are a whole person, and of course when a client approaches a law firm its needs aren’t really passed through the Swiss cheese filter whatever practice area that law firm has, if needs are more holistic. So being able to use AI to read broadly across information with expertise in multiple domains, you are the ultimate promise of Artificial Intelligence. I see each law firm in the future having its own AI. Now in addition to that there is also the concept of cartridges. Cartridges that are trained to reason like the people who train them such that you could point these cartridges at other data and it would analyze that other data as if by the lawyers who train them. I can see a future where lawyers train cartridges, where there is a marketplace for cartridges. Law firm X got something very, very well but it’s high volume, and it would like to train cartridges for reasons like it, and it offers them as a subscription service to its clients. Clients point those at their own data and they get the benefit of all the knowhow, the specific reasoning that they already value on that firm applied to their information. This is another change that I foresee. Jim Calloway: Well, discussing technology changes, and if I might say, things lawyers are scared of and don’t want to think about, is there an intersection between Cognitive and AI and the Blockchain technologies we hear so much about? Sharon D. Nelson: I knew you were going there, Jim. Brian Kuhn: There is and until very recently these two technologies have been presented as a separate transformational monoliths, AI and blockchain, but how do they intersect? AI deals with unstructured data largely, blockchain as we know, deals largely — has largely dealt with structured data. Well, until now lawyers and their clients have operated in a world of complex of disconnected siloed information, that’s not new news. Locating facts determining if-then conditions like those contained in the Uniform Commercial Code and whether those conditions have been met, arguing rights and obligations, these are some of the tasks that have complexities in legal processes and the beauty of blockchain is its simplicity. It’s a platform for everyone to know what’s true, full visibility end-to-end. Trust is with blockchain records. A blockchain is essentially a — we have heard the word “ledger” but really think about, it is a decentralized database, it stores linked records of time-stamped blocks, with each block representing a consensually agreed-upon record like a section of the UCC, each block is unchangeable, it refers to the previous block, and it’s publicly visible to those who are members of that particular blockchain consortium, and it’s confirmed by consensus. So how might AI and blockchain work together in the year 2000, the United Nations formed something called the Kimberley Process with the intent to reduce the proliferation of blood diamonds, conflict stones. And these are outlawed of course but they still make their way into legitimate supply chains due to fraud. Working in partnership with Everledger, Watson read the Kimberley Process in Dawkins, so it read the unstructured data as if it were a person extracted the conditions required to certify the diamonds as compliant and these are recorded in the blockchain, and these conditions were then applied to a historical record, back tested in other words, over a million diamonds, which contain narrative text that cognitive read to identify non-compliant stones and uncovered correlations about the originating country, shipping period, value. In other words, cognitive can read and understand almost anything in context. blockchain provides universal veracity, universal truth. Imagine doing this with the Uniform Commercial Code, the tax code, e-discovery, especially with the advent of the Internet of Things when there will be billions of times more data than there is now, evidence chain of custody in criminal matters, et cetera. This is how these technologies will come together. Sharon D. Nelson: Well, we want to thank you so much for being our guest today, Brian. I think the word to describe this podcast, Jim, is “mind-bending”. Jim Calloway: Sharon, the Universal Truth of the Uniform Commercial Code, yeah. I didn’t think about that one. I had that class in law school, I will tell you. Brian Kuhn: It’s been a pleasure and an honor. I really appreciate the opportunity to speak with you. Sharon D. Nelson: Well, thanks for taking the time, Brian, we really do appreciate it and we know our audience does. And that does it for this edition of The Digital Edge: Lawyers and Technology. And remember, you can subscribe to all the editions of this podcast at HYPERLINK “http://www.legaltalknetwork.com” legaltalknetwork.com or on Apple Podcast. And if you enjoyed our podcast, please rate us on Apple Podcast. The views expressed by the participants of this program are their own and do not represent the views of nor are they endorsed by Legal Talk Network, its officers, directors, employees, agents, representatives, shareholders and subsidiaries; none of the content should be considered legal advice. As always, consult a lawyer. Adriana Linares: Starting your own solo practice is tough. Hi, my name is Adriana Linares and I host a show called New Solo on Legal Talk Network. In it, I interview successful lawyers who have gone solo and experts in marketing, management, technology and everything else you need to know that you didn’t learn in law school. Find us on iTunes, Google Play or at HYPERLINK “http://www.legaltalknetwork.com” legaltalknetwork.com.